Every month a student of the Integral Ballet is honored for noteworthy achievements, extraordinary behavior and/or general excellence. These achievements may or may not be dance-related, but show what it means to be an exemplary student of ballet. We love to see our students going above and beyond in every area of their lives. 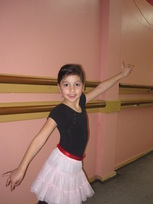 Penny is a Level 1 Dancer, Age 6, taking ballet, tap, and jazz, at Integral Ballet. Penny has been working on a duo with Aidan Marten for her jazz dance that includes turns and lifts that would even be challenging for older dancers! Penny has shown a great deal of dedication to her lessons, remembers all of her own choreography, and already knows what it takes to be a great performer! She will be performing a tap solo, jazz partnering duo, and a ballet piece in this year’s recital entitled Ballet’s Greatest Ghost Stories. It is unusual for such a young dancer to show as much determination as Penny and her teachers have really enjoyed having her in class!